Bettina Wyngaard was born on 15 January 1971 in Cape Town and grew up in Grabouw and still lives in the Overberg area. She studied law at Stellenbosch University, where she received a B.A. and LL.B. and worked for ten years as an attorney focussing on women's rights. From 2007 Bettina was the director of Women's Legal Centre (WLC) in Cape Town. Afterwards she was serving the Anglican Church in Somerset West. She now lives again in Grabouw as a full time writer. 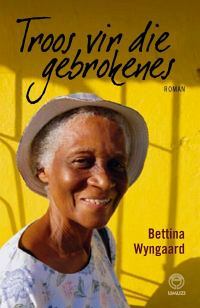 Her first book, Troos Vir Die Gebrokenes won the WOORDtroFEES of Stellenbosch University, Via Afrika Literary Award 2010 and the Jan Rabie-Rapport price for innovative prose, 2010. I write mostly in Afrikaans, but have never felt comfortable with the Afrikaans literature that is available out there. I felt it did not really reflect my reality, with the result that I read mostly English. Eventually, I realised that instead of complaining and bemoaning the lack of fiction reflecting my reality, I could be the voice telling those unheard and untold stories.